Hello all you fellow Tabletop gamers out there! Geek Pride has had a cracking year of finding new board games, card games and paper RPGs to keep us playing well into the wee hours. But which games have stood out for us in 2015? Well how about I invite the guys over to talk you through their choices for this awesome year and give you the run down of Geek Pride’s Tabletop games of 2015! 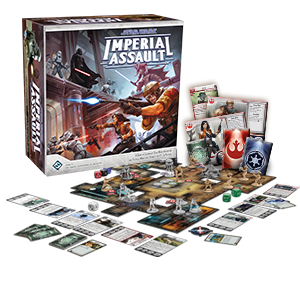 My table top game of 2015 is Imperial Assault. For all of you who are familiar with Fantasy Flight’s dungeon crawler Descent, it’s pretty much that but a Star Wars version and its freaking mint. I love Descent but being a huge Star Wars fan, having a dungeon crawler that is… well Star Wars was like Fantasy Flight reached into my mind and vigorously probed me for my every gaming desire; what’s that Matt, you like miniature skirmish games as well, isn’t that lucky, you can use, annnnd collect (yeah baby you like that don’t you) the miniatures in the game and have them as a skirmish game too….. TAKE MY MONEY ONCE AGAIN FANTASY FLIGHT… Take my money! Well, when asked what my top game of 2015 has been, immediately I jumped to Betrayal at House on the Hill by Avalon Hill Games, for 3-6 players. Betrayal puts the players in a cooperative scenario until there have been enough “Omens” to trigger the “Haunt”. Each Haunt is randomly generated and puts one of the players in the role of the Betrayer and I have never played the same Haunt twice as yet. Needless to say, the Betrayer then has to kill the other players in their randomly generated mansion of tiles. Overall, this game is incredible and really creates a sense of teamwork, both before and after the Betrayer is decided. If you haven’t played it yet, I highly recommend you find a copy and some people to give this great game a try. With its 5th Edition, Dungeons & Dragons is back in a big way. Without going into “Edition Wars”, it’s exactly what D&D is supposed to be (at least for me) – a flexible system wherein you can create any character, and roleplay that character exactly how you want; all without contending with either overcomplicated rules-bloat, or bearing with stripped down boardgame-like mechanics. In previous editions, a certain amount of min-maxing was essential for a strong build, but 5E rewards roleplaying as much as hitting hard – the inspiration system, while nothing new, is a stroke of genius. In short; it’s easy to pick up, but deep enough to keep you hooked. It will never leave my gaming table! This was a really tricky call for me. I’ve managed to get so many good games to the table this year: Hyperborea, Five Tribes, Codenames. But the one game that consistently hits the table and gets a giggle from everyone is Rhino Hero. With it’s super simple ruleset (effectively Jenga with special cards) I’ve introduced RH to family and ‘non-gamers’ and as a warm-up to start more serious evenings of gaming. It’s also playable at all ages and cheap to buy, meaning you won’t worry about the kids wrecking your copy (well, not too much…). It’s bright, colourful, engaging and plays in 5 minutes. What more do you want from a filler game for literally everyone! 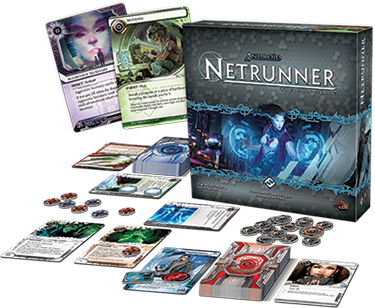 I was asked to pick my game of 2015 and without surprise it had to be a Fantasy Flight called Netrunner, a collectable card game for 2 players released several years ago but only came onto my radar a few months ago. Netrunner pitches two players against each other in a cyberpunk future, a Runner attempting to hack into Corporation servers to steal information. They must break through ICE placed in their way using programs and equipment. It’s such a simple game, but one that perfectly puts me in that cyberpunk future. It combines Hackers with Shadowrun, and you can play it straight out of the box. I love playing this game, it never gets boring and never gets old. I just give Fantasy Flight games part of my monthly wage, as the majority of games they produce are dynamite. If you want to be a super-fly hacker, or a stuck up Corp exec, go play this game. All images contained in this article link to the owning company.